For most athletes, the fall and winter is a time to reflect on the past season and establish target races and goals for the following year. There are several approaches and philosophies to goal setting and different levels of emphasis placed on its importance, but regardless of the route taken, many athletes especially, long course triathletes, tend to arrive at time based targets. Maybe it’s 5 hours for a Half IRONMAN, or 12 hours overall for a full IRONMAN, or perhaps cracking two and a half hours or six hours respectively on the bike leg. While there is nothing inherently wrong with a time based goal at any ability level, they are often established somewhat arbitrarily and are based on targets or milestones that are commonly touted within respective racing communities. In addition, they can be influenced by several factors out of the athlete’s control that may impact success or failure. While standard targets certainly give athletes something to “chase”, this approach can often lead to an unrealistic target and disappointment, or a target that is too easily achieved and the athlete doesn’t maximize their potential. This may seem obvious, but it’s often overlooked and its significant factor. A similar “effort” could result in drastically different times depending on the course. Things to consider include: How hilly is the course? Does it have a lot of turns requiring a relatively high amount of slowing and accelerating? Does the course suit your strengths or does it hit you right in your weak area? Is the distance accurate? Have you done it before? Have competitors you know done it before and if so, what was their time relative to how they have finished to you in other events? Similar to the physical features of the course, climate can play a major factor in establishing realistic target times. Heat, cold, rain, wind, and altitude all can dramatically impact your performance on a given day in a given location. Also differences between training and racing environments (training in a warm climate but racing in a cold one or vice versa) can have a significant impact. Taking into account the course and environmental conditions, consider the past times and the conditions and courses they were conducted in. Is your target time pragmatic in light of these factors? Does the goal represent a huge leap or a minor improvement for you personally? If you use power or heart rate data to monitor your racing and training, you can also develop insights to gauge what might be realistic based on observed trends. Accurate self-reflection and/or input from a trusted partner can help immensely here in taking all of these factors into account. In general, newer athletes still on the “rise”, or shifting to a more focused training program from a less focused approach may have a lot more room for improvement and can take big chunks of time out. More experienced athletes who are using tried and true approaches are less likely to see large improvements in similar conditions. As we know, aerodynamics play a huge part in cycling performance. Athletes should consider the equipment and position they used to establish their current best times and then take into account any changes that may have made (or are considering making) that may benefit their performance. Maybe you established a more aero position through a new bike fit, purchased different wheels, or shifted from a ventilated road helmet to a more aero one. These changes may all impact your potential on the bike. Considering all of these factors can help you shape a more realistic target, but there is still a large degree of subjectivity involved, especially for the bike portion which is the lengthiest and most technically complex in terms of predicting performance. A further enhancement to your planning would be to fully leverage power data and more objective tools such as Best Bike Split (BBS) to make more sense of the complex dynamics and refine targets even further. BBS is used by inputting a specific course using GPS data (several well-known courses are already loaded and can just be selected), the date and time of the race, and a number of attributes about the rider’s equipment and physical parameters. Once all of the parameters are entered, the modeling algorithm pulls forecasted weather data for the location, date and time, and crunches all of the user inputted numbers. The output is a nice report that provides either a predicted time based on inputted projected power, a target power output for the rider’s desired time, or a predicted Training Stress Score based on anticipated intensity and duration of the effort. It’s very easy to perform multiple runs with BBS. Tweaking parameters such as equipment selection, weight and power outputs allows you to create a host of “what if” scenarios to identify focus areas and a solid range for a target time or power. You can also make additional runs as you get closer to the event based on updated fitness and weather forecasts to fine tune your target prior to race day. However, before you get too involved, I would highly recommend calibrating the tool to increase your confidence in the projections. Let’s consider an athlete who is focusing on an IRONMAN and how they might use the tool to refine their goal for a particular event. While we have spoken a lot about time targets up to here, at this point, I would recommend a departure from this line of thinking. Since we can’t control the weather, the course layout and ultimately the resulting time, I would recommend focusing on something we have more direct influence over, power. Specifically, target power as a percent of Functional Threshold Power or (FTP) as an input to BBS. Instead of focusing on a target time goal, the athlete would look to come up with a goal FTP and percent of FTP they would want to hit for the event and the time would become a secondary factor. 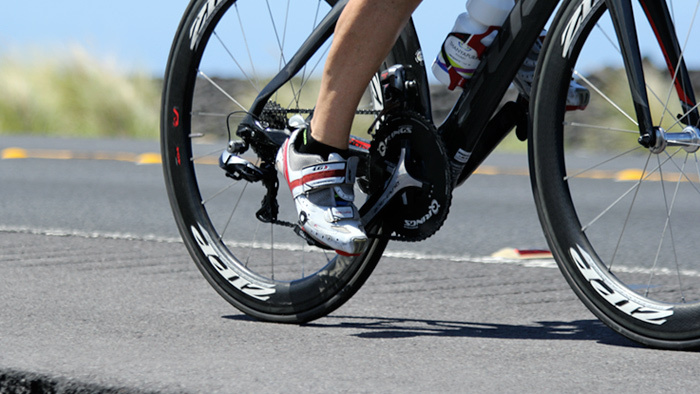 We know from reviewing this article, that depending on the experience of the athlete and their relative running and cycling strengths, a good target power for an Ironman bike split is between 65 and 80 percent of FTP equals the maximum average power that can be sustained for one hour on the bike. To figure out what percent FTP is a good starting point, looking at the your prior events of a similar duration where you had a good performance and identifying the percent FTP ridden during that performance. If the percent of FTP for the bike split was on the low end of the spectrum and/or you are a newer athlete, this likely indicates you have potential for improvement on the bike by increasing your FTP. After conducting a baseline run with the prior target power, additional runs can be conducted to see the forecasted time impact of a change in percent of FTP or in overall FTP itself if there is evidence there is room to grow in this area as well. If your percent FTP pacing is pretty much maxed, and from experience there isn’t a lot of room for raising FTP overall, then you may want to look at other tweaks such as equipment changes and conduct additional runs with these parameters tweaked. In the case of strong cyclists, you find investing more time on the bike or on equipment isn’t the right answer and you may want to look at improving their run instead. While this can seem a little overwhelming at first, BBS helps to methodically consider the variables and see the impacts of changes through multiple runs. Once you get into it, the analysis goes quite quickly and gives you tremendous insight into your strengths, focus areas for improvement and if used as suggested, provides something more directly in your control to focus on. Given the time investment athletes make in training and racing, investing a little extra time upfront to establish more realistic personalized goals will help you prepare with confidence, maximize your precious training time, and get the most out of your racing efforts.